Facebook is facing a public relations nightmare surrounding its collecting and sharing of user data. Here is the short version. A Cambridge professor used a Facebook survey app to obtain profile information from the 300,000 people who participated. He also was able to gather profile information of an additional 49 million users because Facebook had a setting to pull friends’ information, too. That got into the hands of a marketing company called Cambridge Analytica, which famously helped Donald Trump with online advertising during the presidential campaign. This has created much discussion about how much data is being collected by websites and online services and how marketers use that data. It’s also causing many internet users to consider the cost of “free” services, such as Facebook. But how is this affecting advertising for ecommerce companies? That’s what I’ll address in this post. The biggest impact so far is the announcement from Facebook that it will shut down “Partner Categories,” which enable third-party data providers to offer targeting directly on Facebook. The announcement is quite broad. Since 2012, Facebook, to improve its targeting, has been integrating data from major information providers. Companies such as Acxiom, Epsilon, Experian, Datalogix, and Quantium may not be household names. But they pull information from seemingly everywhere — from shopping loyalty programs to credit card transactions. Which targeting criteria will Facebook eliminate? 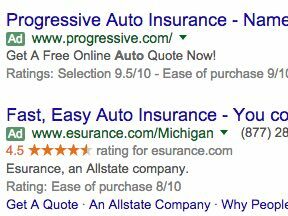 In-market audiences, such as someone looking to buy a new car. Buyers of certain product categories, such as hair car or cleaning supplies. Facebook is moving quickly to simplify privacy settings and data collection. 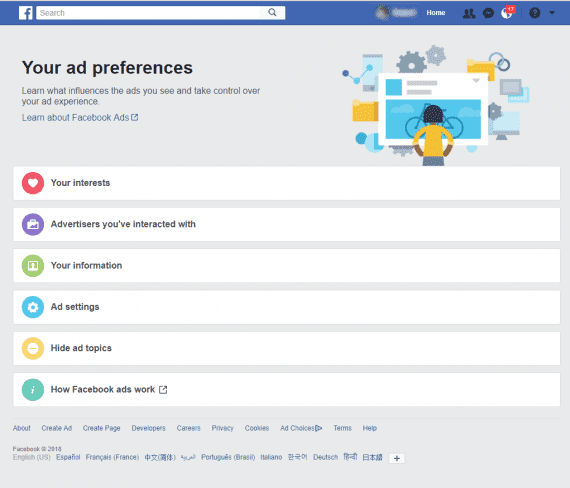 What most affects advertisers is the area Facebook has named “Your ad preferences.” Any Facebook user can go to this page while logged in and identify what influences the ads she sees. Facebook users can go to “Your ad preferences” and see the variables that determine which ads they see. 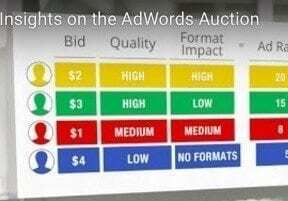 Each of the areas in “Your ad preferences” is worth exploring. Here is a sample. From “Advertisers you’ve interacted with,” users can see which companies have their contact info, which advertiser websites or apps the users have visited, and which ads they’ve clicked. Users can then choose to hide ads from any company. This will allow targeted consumers to opt out of ads, even if they were included in a custom audience list. From “Your information,” users can choose how advertisers target them, such as relationship status, employer, job title, education, and categories. Sample categories are “Parents with toddlers,” “Owns: Google Pixel,” and “Engaged Shoppers,” which are users that have clicked in the last week an ad with the “Shop Now” call-to-action button. From “Ad settings,” users can turn off ads based on whether they have visited a website or app, even from companies that didn’t directly advertise on Facebook (likely the Facebook Audience Network). This could significantly shrink Facebook’s advertising reach if users begin opting out en masse. It could also reduce Facebook’s ad revenue. Regardless, Facebook is attempting to address valid user concerns, which is a good step. Facebook isn’t the only company that is addressing privacy concerns. 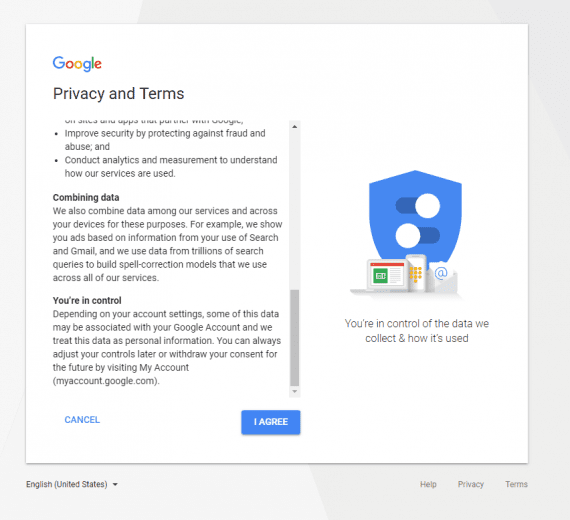 Last week, as I was setting up a new Google account, I came across the following change to the “Privacy and Terms” disclosure. 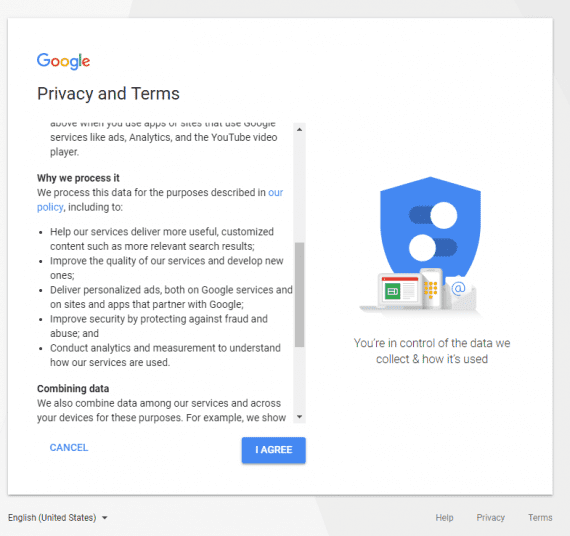 The first section, “Data we process when you use Google,” clearly explains that, depending on the user, Google collects email addresses, phone numbers, Gmail messages, info from YouTube comments, device IDs, IP addresses, and location. 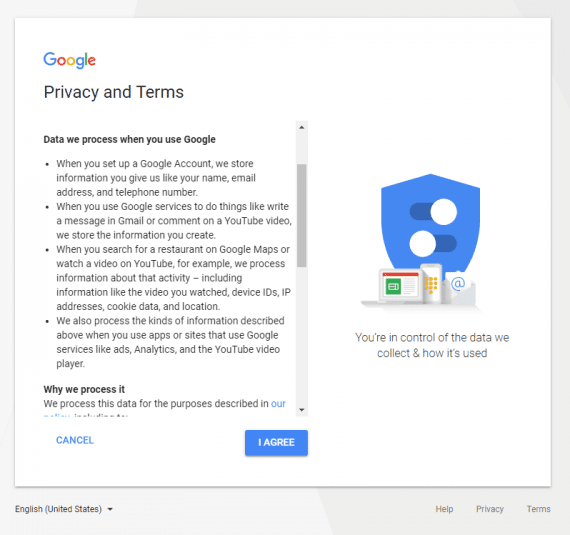 The “Data we process when you use Google” section explains the type of info that Google collects. The second section, “Why we process it,” explains that Google will use that information to serve better search results, more personalized ads — is this a benefit? — and increase security. The second section, “Why we process it,” explains how Google will use the information. And in the last section, “Combing data,” Google reminds us that it can connect and associate any and all data. In the “Combing data,” section Google states that it can connect and associate any and all data. All of this is changing daily. However, advertisers should act on three key points. Continue collecting your own data. In advertising parlance, this is called “first party” data. Collect names, email addresses, and phone numbers from users that respond to your ads. Email and text marketing will likely become more important. Custom audiences will become more important. Make sure that users understand what you’re doing with their info when they opt in or sign up. Focus on your customers. Uncertainty about data privacy will affect revenue, from small companies to giant ones, such as Facebook. Calm those concerns and consumers will trust you even more. View this as an opportunity.